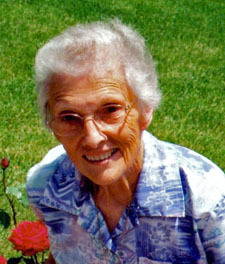 Vivian Virginia Hamann of Longmont died October 31, 2011 at the HospiceCare Center in Louisville. She was 81 years old. She was born February 15, 1930 in Haxtun, Colorado to Frank Filmore and Sarah Iona (Salvador) Lett. Vivian graduated from Buffalo Grass Grade School, Phillips County High School in 1948 and St. Luke’s Nursing School in 1952. She married Milton L. Hamann on September 3, 1950 in Holyoke, Colorado. They moved to Longmont from Arvada in 1967. Vivian was a registered nurse and Director of Nursing at Valley View Hospital until 1965 when she entered private practice nursing. Vivian then owned and operated the A&W Root Beer Restaurant in Berthoud for 24 years, from 1971-1995, when her son Randy took over the business. She served on the Executive Board of NAWFA, the National A&W Franchising Association, from 1989 until 1993. She was a lifetime member of Epsilon Sigma Alpha and a member of Berthoud United Methodist Church where she was active as a Deacon and served as Treasurer, she later attended Calvary Church in Longmont. Vivian had a great love and dedication to her family, extended and immediate, never missing an opportunity to spend time vacationing, family reunions or doing holiday gatherings. Vivian’s passion was riding Harley Davidson motorcycles, beginning on June 14, 1947 when her brother took her for a ride on the back of his bike. During her lifetime, Vivian owned three Harleys, her final motorcycle being a 1950 Harley Davidson Panhead she named “Ching Fu,” which means “Brings Great Happiness.” Riding brought great happiness to Vivian. Her motorcycle was the conversation starter between Vivian and her husband Milton, leading to a ride on her bike and their eventual marriage. She attended the Sturgis Motorcycle Rally and the Gypsy Tour Motorcycle Classic. Vivian was the only woman on a motorcycle club/softball team called The Reservation Ramblers and won a Third Place Trophy in 1955 for her participation. Vivian’s second livelong passion was her yard and flower gardens, if she wasn’t riding her Harley, she was happiest in her garden. She also enjoyed looking at customer’s motorcycles and hearing their stories while working at the A&W. Vivian was preceded in death by her parents and a grandson, Robbie Hamann on May 12, 2003. She is survived by her husband Milton L. Hamann; three sons, Randy R. Hamann (Judi), Nicholas N. Hamann and Monte M. Hamann (Susie) and one daughter, Jodi J. Mossoni (Mark); her brother, Harris H. Lett; two sisters, Lola L. Ozman and Janette J. Benedict and her grandchildren, Kory Mossoni, Joleen Mossoni, Rustin Hamann, Jordan Hamann, Nicole Hamann, Kalen Solano, Lyndsay Solano and Jaxson Hamann. Visitation will be held from 4:00 – 6:00 p.m. on Tuesday, November 8, 2011 at Ahlberg Funeral Chapel with family present to greet friends. A funeral service will be held at 1:00 p.m. on Wednesday, November 9, 2011 at Calvary Church, 2101 Gay Street in Longmont. Weather permitting, there will be a tribute ride from the church to Greenlawn Cemetery. Interment at Berthoud Greenlawn Cemetery. Memorial contributions may be made to Epsilon Sigma Alpha and mailed to Ahlberg Funeral Chapel. Share condolences at www.ahlbergfuneralchapel.com . Site contents copyright © 2019 Recorder Online	except as noted. All rights reserved. | 90 queries in 2.174 seconds.